I’m just gonna go ahead and say it: I don’t really know what to make of Erin. Most of last season, her story was centered around whether or not she and Andy would get together, and that was pretty much all we knew about her — that the doe-eyed receptionist was sweet and perfect for him. Then at the beginning of this season we were abruptly told that she had dumped Andy over the summer, leaving him for Gabe. Now, this week, we learn a little more about her odd father/daughter dynamic with Michael. For an episode whose premise can be summed up in one sentence (“Erin and Gabe host a Glee viewing party”), this week featured a surprising amount of character development. Michael learns that the rest of the office considers Gabe to be their boss, and after engaging in a brief power struggle with him over the TV volume, he retreats to the bedroom to sulk before eventually cutting the cable. Erin discovers him and calls him out, saying she just wants Michael to like Gabe. After Michael snaps, “I’m not your father,” the two exchange teary-eyed looks that eventually evolve into knowing grins. He then tells Erin to go to her room. It’s a weird moment, but it works. We know Michael’s been desperate to have kids in the past, so seeing him as a father figure was oddly touching. If anything, it left me hoping for more Erin backstory in the coming weeks. Why does she need Michael’s approval so badly? What’s her motivation for staying with Gabe? Most importantly, why’d she dump Andy when they’re obviously in love? Speaking of Andy, he spent a lot of this episode puking up seahorse powder that he found in Gabe’s room and pining over Erin. 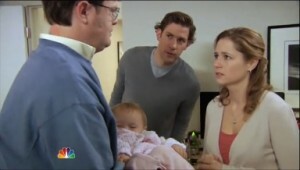 Some of it was painful to watch (in that good, old-fashioned Office awkwardness kind of way), but it was balanced well by other comedic moments in this week’s episode, like Jim hand-feeding Dwight a pepperoni or Creed discussing Glee with Kevin (“Finn and Puck decided to put aside their differences, you guys. The solo’s going to be a duet now.” “Man, I CAN’T BELIEVE WE MISSED THAT!”). After last week’s dud, The Office bounced back with a solid episode. Like all good TV shows should, it left me wanting to tune in next week and see what’ll happen next. Who knows? Maybe Erin will surprise us yet again and run away with Michael. We don’t really know much beyond the surface of her character yet, but I for one can’t wait to find out more. -Where were Toby, Meredith and Stanley this week?